A change in the price of a commodity alters the quantity demanded by consumer. This is known as price effect. However, this price effect comprises of two effects, namely substitution effect and income effect. 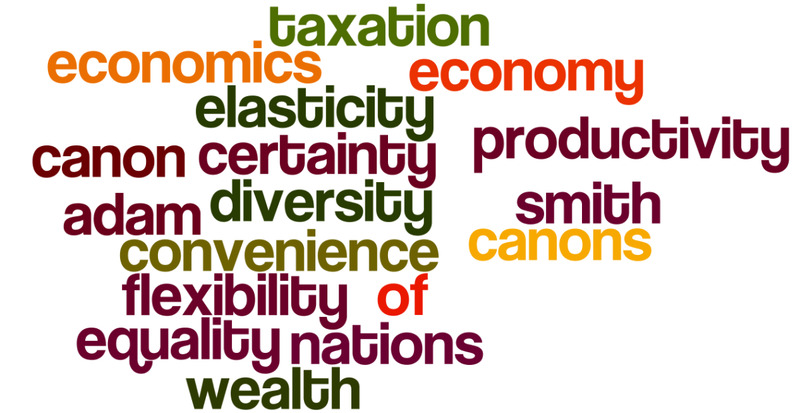 Let us consider a two-commodity model for simplicity. 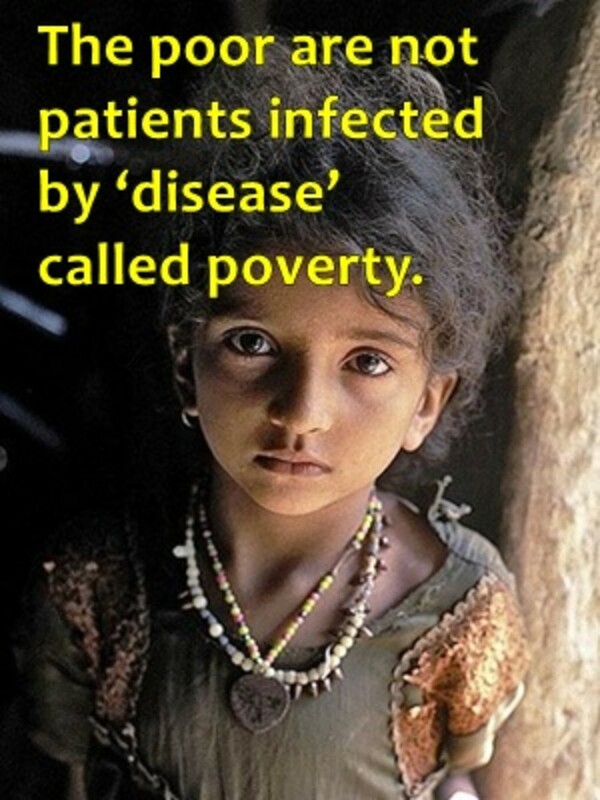 When the price of one commodity falls, the consumer substitutes the cheaper commodity for the costlier commodity. This is known as substitution effect. Suppose the consumer’s money income is constant. Again, let us consider a two-commodity model for simplicity. Assume that the price of one commodity falls. This results in an increase in the consumer’s real income, which raises his purchasing power. Due to an increase in the real income, the consumer is now able to purchase more quantity of commodities. This is known as income effect. Hence, according to our example, the decline in the price level leads to an increasing consumption. This occurs because of the price effect, which comprises income effect and substitution effect. Now, can you tell how much increase in consumption is due to income effect and how much increase in consumption is due to substitution effect? To answer this question, we need to separate the income effect and substitution effect. How to separate the income effect and substitution effect? 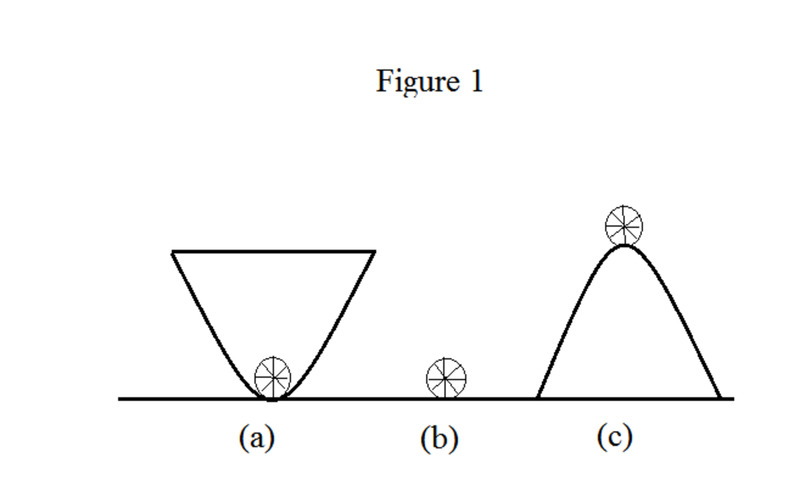 Let us look at figure 1. 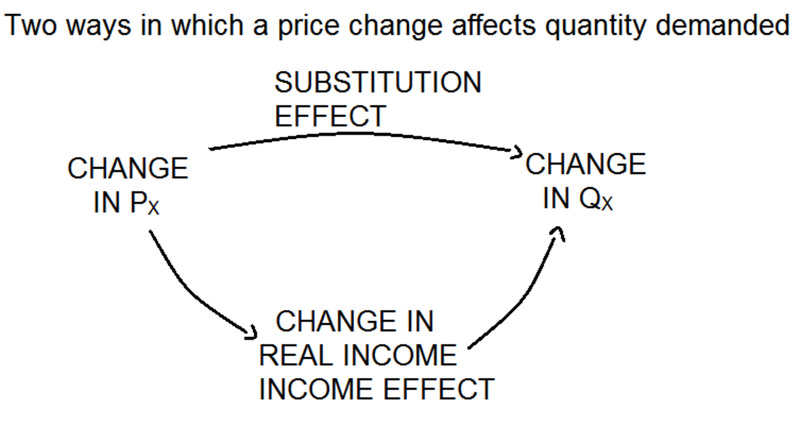 Figure 1 shows that price effect (change in Px), which comprises substitution effect and income effect, leads to a change in quantity demanded (change in Qx). The splitting of the price effect into the substitution and income effects can be done by holding the real income constant. When you hold the real income constant, you will be able to measure the change in quantity caused due to substitution effect. Hence, the remaining change in quantity represents the change due to income effect. Let us look at J.R. Hicks’ method of bifurcating income effect and substitution effect. 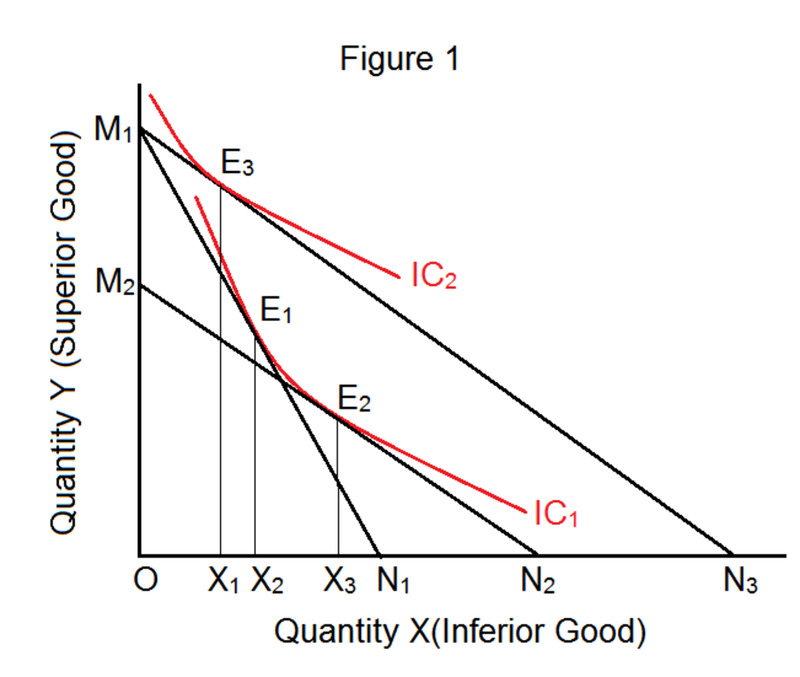 In figure 2, the initial equilibrium of the consumer is E1, where indifference curve IC1 is tangent to the budget line AB1. At this equilibrium point, the consumer consumes E1X1 quantity of commodity Y and OX1 quantity of commodity X. Assume that the price of commodity X decreases (income and the price of other commodity remain constant). This result in the new budget line is AB2. Hence, the consumer moves to the new equilibrium point E3, where new budget line AB2 is tangent to IC2. Thus, there is an increase in the quantity demanded of commodity X from X1 to X2. 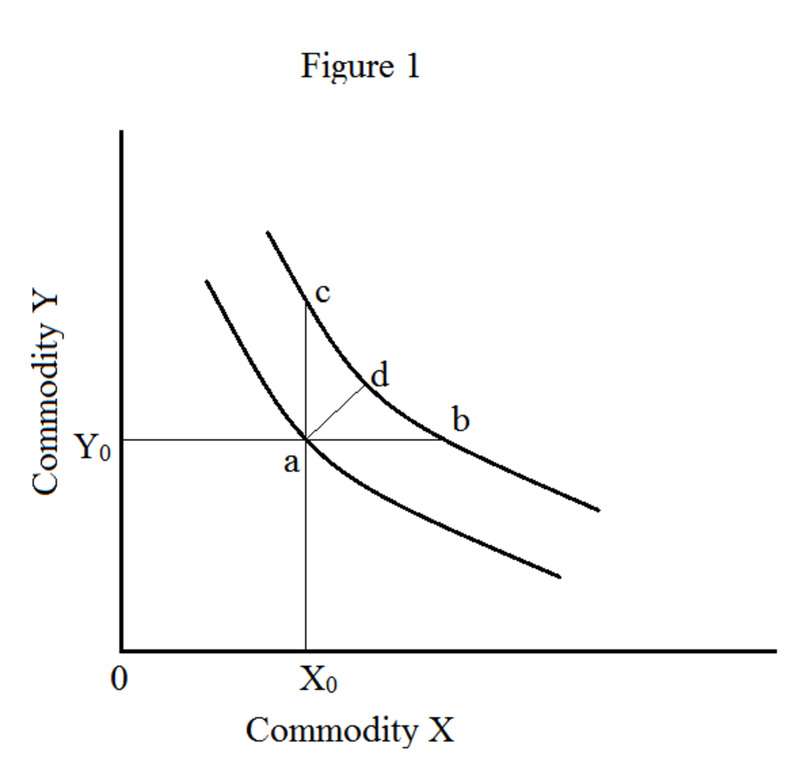 An increase in the quantity demanded of commodity X is caused by both income effect and substitution effect. Now we need to separate these two effects. In order to do so, we need to keep the real income constant i.e., eliminating the income effect to calculate substitution effect. According to Hicksian method of eliminating income effect, we just reduce consumer’s money income (by way of taxation), so that the consumer remains on his original indifference curve IC1, keeping in view the fall in the price of commodity X. 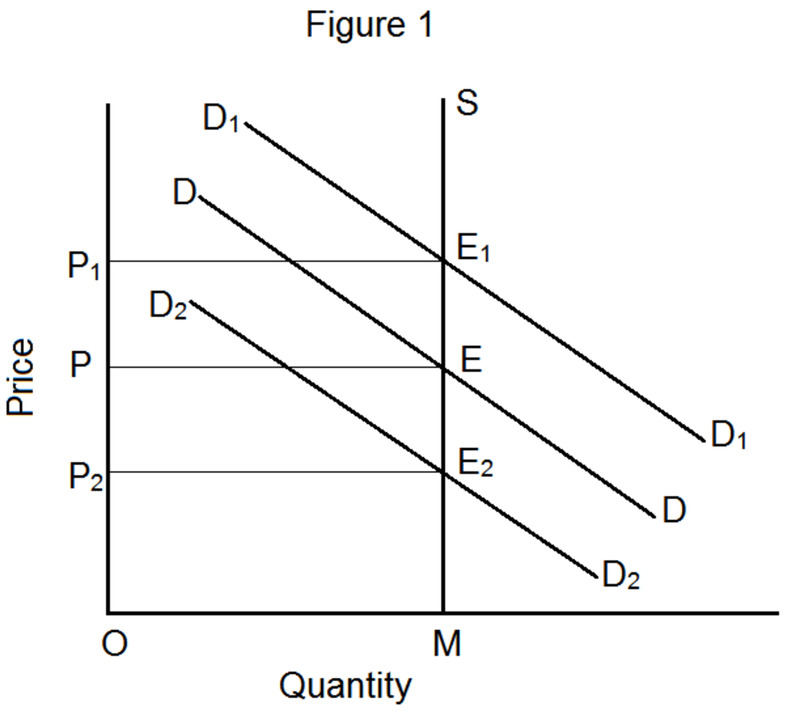 In figure 2, reduction in consumer’s money income is done by drawing a price line (A3B3)parallel to AB2. At the same time, the new parallel price line (A3B3) is tangent to indifference curve IC1 at point E2. Hence, the consumer’s equilibrium changes from E1 to E2. This means that an increase in quantity demanded of commodity X from X1 to X3 is purely because of the substitution effect. We get the income effect by subtracting substitution effect (X1X3) from the total price effect (X1X2). Now let us look at Eugene Slutsky’s method of separating income effect and substitution effect. 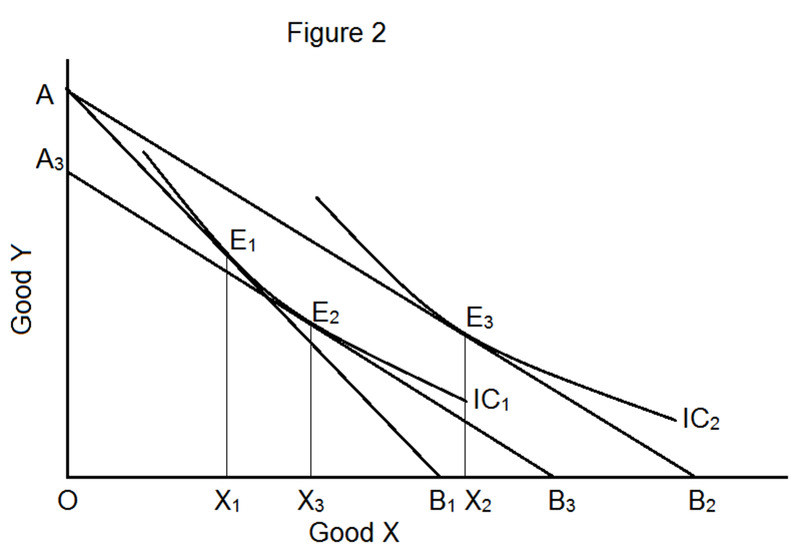 Figure 3 illustrates the Slutskian version of calculating income effect and substitution effect. In figure 3, AB1 is the initial budget line. 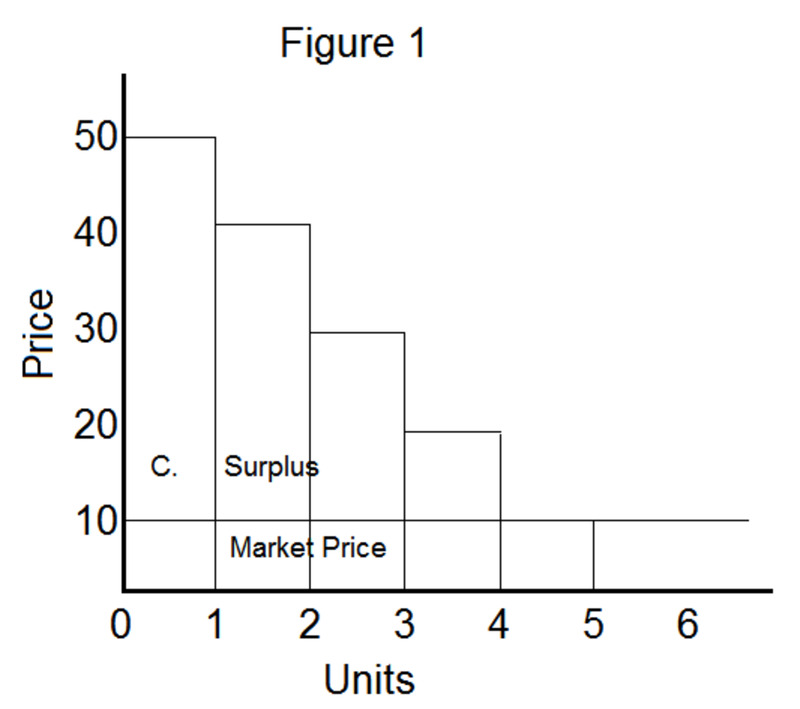 The consumer’s original equilibrium point (before price effect takes place) is E1, where indifference curve IC1 is tangent to the budget line AB1. Suppose the price of commodity X falls (price effect takes place) and other things remain the same. Now the consumer shifts to another equilibrium point E2, where indifference curve IC3 is tangent to the new budget line AB2. 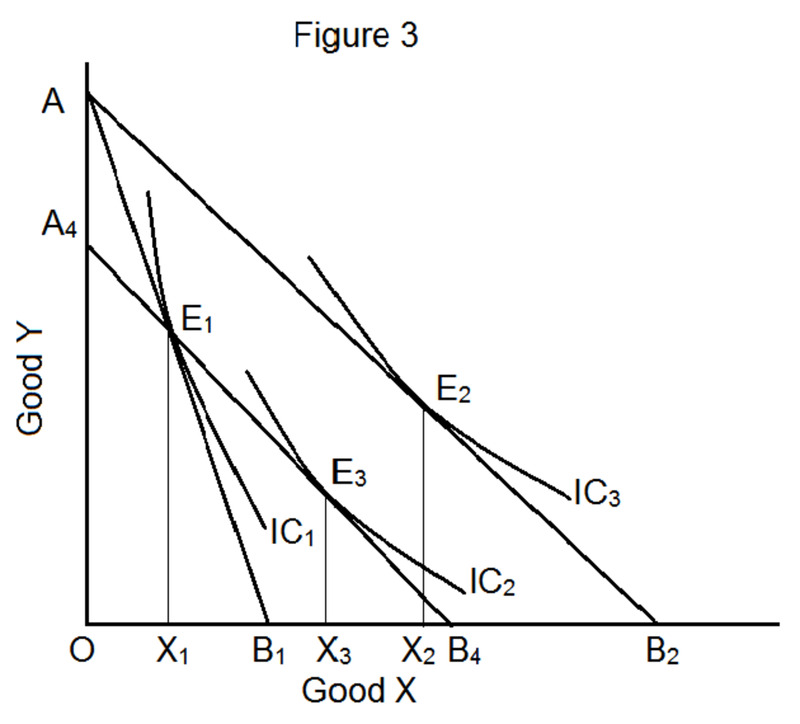 Consumer’s movement from equilibrium point E1 to E2 implies that consumer’s purchase of commodity X increases by X1X2. This is the total price effect caused by the decline in price of commodity X. Now the task before us is to isolate the substitution effect. In order to do so, Slutsky attributes that the consumer’s money income should be reduced in such a way that he returns to his original equilibrium point E1 even after the price change. What we are doing here is that we make the consumer to purchase his original consumption bundle (i.e., OX1 quantity of commodity X and E1X1 quantity of commodity Y) at the new price level. In figure 3, this is illustrated by drawing a new budget line A4B4, which passes through original equilibrium point E1 but is parallel to AB2. This means that we have reduced the consumer’s money income by AA4 or B4B2 to eliminate the income effect. Now the only possibility of price effect is the substitution effect. Because of this substitution effect, the consumer moves from equilibrium point E1 to E3, where indifference curve IC­2 is tangent to the budget line A4B4. In Slutsky version, the substitution effect leads the consumer to a higher indifference curve. this was awesome .....well expounded...all due gratitude to u Senior Economists!!! Thank you very much. It was quite explicit. This has broken it down so well! Thank you! Thank you so much........Your explanations were great!